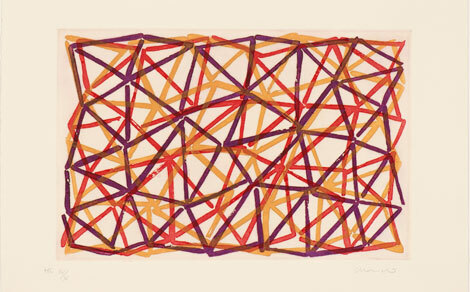 A selection of the original graphic art by Joaquim Chancho, produced between 1972 and 2013, composed of serigraphs, etchings and lithographs, can be seen at Espai d’Art Pere Pruna in Montserrat’s Museum (MDM) from 10th November to 15th March 2015. The exhibition –named Estampes (Prints)- is made up of forty pieces produced from different techniques – some of them in collaboration with artists and different graphic art workshops in Barcelona. According to curator Antònia Vilà, the works on exhibit share “the observation of painting as a means of looking into processes which allow us to emphasize essential features which become sphere and two-dimensional support for transcription and printing”. Joaquim Chancho’s work is strongly motivated by a graphic thought, orientated to set the boundaries of space and feel it as a place of inscription. Chancho has always shown predilection for paper as a formidable support, a material which he also uses as an instrument for experimentation. According to Chancho: “the paper is the place where he examines the abstraction of space and the sign, two elements that are linked in his work in a radical introspection, which search for the deep unity of the being”, claims Antònia Vilà. The emptiness of the blank sheet triggers an intensive and laborious challenge around the idea of process and route. Therefore the artist –through a list of series- favours the journey of the being in progress’ recording, which he believes it is more important than the end or aim. The works on display in Montserrat show a personal graphic biology of the drawing and the painting, which are attached to the wall depending on the concept, the composition, the diction and the geometry. “They try to versify the different perceptions of tracks that pass by structures and linear series towards the spot-pattern, all of them always linked to the values of the used techniques”, as curator Vilà stated. This exhibition also shows another facet of the fertility and summit of Chancho’s work: the one that makes sense from the use of the sign, the graphic art and the colour. A few propositions by Richard S. Field head the reading of the prints. They are meant to open a dialogue about language and printed work. On the other hand, they are quite a significant story about the questioning and the dynamics which produce the evolving practices of the seventies, associated to what we find here. Field’s propositions were written in order to re-think the printed work in the context of the American graphic art. Following the example of the linguistic games in Sentences on Conceptual Art by Sol Lewitt (1969), Field reflects on the printed art. He also plays without granting a privilege to the idea over the execution, to analyze and compare the contradictory attitudes towards prints. It is important to remember that Joaquim Chancho was responsible for the first temporary exhibition of the new MDM (Joaquím Chancho, a Contemporary Classic). The Museum was renewed 10 years ago, and has ever since bet on contemporary art. So this artist from Riudoms (Tarragona) is a “repeater” in Montserrat.